This year, we have a greater emphasis on the use of elecronic resources, a renewed commitment to celebrating literacy across the board, and a new library assistant! It's a new year! 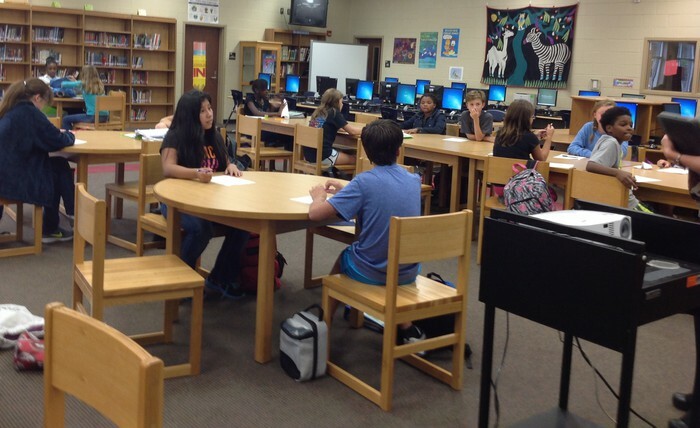 The new school year brings excitement, new opportunities, laptops, and orientation. How do these four things fit together? During orientation, students learn not only about library policies, how to find print sources, and AUP, they log into laptops, check out ebooks, and learn about electronic sources available to them. Last year we circulated over 1700 ebooks, and all students made use of Destiny resources in their research units. We would love to expand on the use of electronic books and study tools, so this year, we are making sure we cover accessing and using these resources during orientation. We are hitting the ground running! It's a new era, and our goal is to make sure that every Crayton student will be confident he or she can find, use, evaluate, and analyze all types of academic resources whether they are in print or found online. 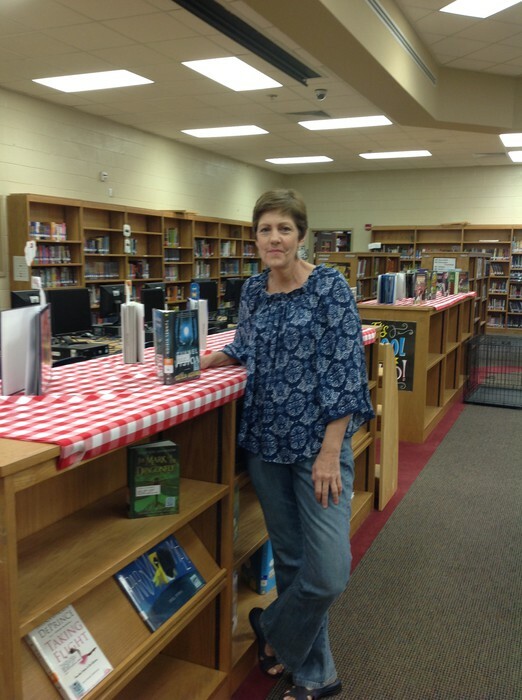 Join us in welcoming Mrs. Donna Sprung as Crayton's new library assistant. 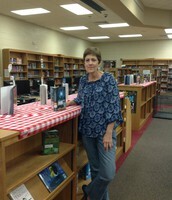 She has been hard at work since before students arrived helping with every aspect of library services. Mrs. Sprung helped with the DLE roll-out, she created book displays, she is wonderful with the students, she handles a variety of extra duties with a smile, and we are grateful to have her with us. A school library the size of Crayton's needs a full-time assistant in order to function and take care of its students and staff. That's why we are so happy to have Mrs. Sprung with us. Stop by to say hello and to see her gorgeous book displays! One of our favorite celebrations of freedom and literacy quickly approaches. During Banned Books Week, we feature all of the books in the Crayton Library that have been challenged and removed from shelves elsewhere in the country. Why were these books challenged and purged? Some readers did not care for the language, traits and behaviors of main characters, magic, religious beliefs, outdated stereotypes, references to sexual activity, and so on. You name it, and it was offensive to someone. 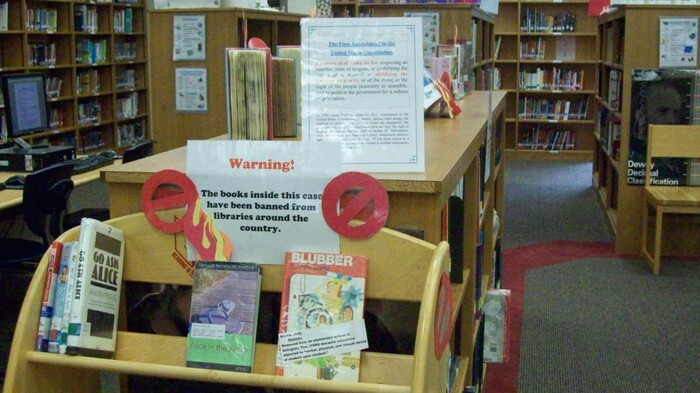 At the risk of offending our Crayton community, the Crayton Library stands by the First Amendment and does not censor, except for choosing books that are age appropriate. We believe every citizen has the right to access information and reading material. What do the kids think? As students point to the display, daily we are asked "Can we check these books out?" The answer is a resounding, "Yes!" In fact, that's our point.